[Notice] Lunar New Year Events! Thread: [Notice] Lunar New Year Events! 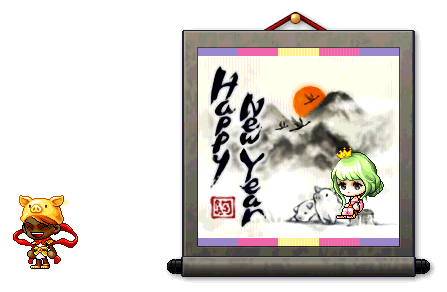 The Year of the Pig is officially upon us, so welcome the Lunar New Year with these special MapleStory events! Take part in the following events to earn special rewards including*Hong Bao currency, which can be traded in at the Hong Bao shop! Each event will be available during the time frame listed above. In the Party Guest Kidnapping*event, you'll be teleported to a special dungeon where you must climb a dangerous cliff and avoid falling rocks so you can get to the top and free the Imprisoned Soldiers who have been kidnapped! After you rescue all of the soldiers, you'll face off against the culprit, Nyen. *In order to defeat Nyen, the player must engage the boss and cause it to drop Burning Flares, then use those Flares to set off fireworks on Nyen until he's been defeated! Players can join this quest by accepting the ‘[Lunar New Year] Kidnapped Revelers’ quest from the star event notifier on the left side of the screen. *Players can enter 5 times per day by accepting the '[Lunar New Year Mission] Reveler Rescue' quest from NPC Suha or from the Lunar New Year event notifier. You can earn the following rewards for defeating Nyen! 2x EXP Coupon: Untradeable, 3-day duration. Use to receive 2x EXP for 15 minutes. Nyen’s Hat Coupon: Untradeable, 7-day duration. Use to get Nyen’s Hat. Nyen Damage Skin: Untradeable, 7-day duration. Dancing Lion Mount: DEF: +10, Speed: 170, Jump: 120, 15-day duration. "[Lunar New Year Mission] A Constant Flow of Guests! ": Requires the player to rescue 88 party guests. Rewards*Hong Bao (x200). "[Lunar New Year Mission] Peaceful Party": Eliminate Vengeful Nyen 8 times. Rewards*Hong Bao (x200). Help characters deliver video messages to their hometown in this*Video Message*event! Start by accepting the quest ‘[Lunar New Year] Lunar New Year Video Message Project’ from NPC Yoria in Lunar New Year Town or from the star event notifier on the left side of the screen. *Log in every day and speak to the that day's character to receive a new Video Message mission. After delivering the message to their hometown and watching the cutscene, you can receive a reward by talking to the NPC again. Hyper Teleport Rock:*Untradeable, 3-day duration. New Year Message Damage Skin:*Untradeable. Help yourself to a daily dumpling in the*Fresh Dumplings*event! To participate, accept the ‘[Lunar New Year] Fresh Dumplings’ quest from NPC Yoria or the star event notifier on the left side of the screen. You'll receive a Hot 'n' Ready Dumpling, which you*can then double-click to receive a "Dumpling Power" buff (grants EXP +100\% and Weapon ATT/Magic ATT +15 for 15 minutes). If you're playing in non-Reboot worlds, you can also find another character and share a dumpling with them by right-clicking and tapping "Share Dumpling." This will grant you a "Duo Dumpling Power" buff (grants EXP +100\% and Weapon ATT/Magic ATT +30 for 30 minutes). Both of these buffs can be received 2x per day. *If you really manage to spread the love and share dumplings 10 times, you'll earn*Alliance Medals (x50)! Gather charms and earn rewards in the*8-Blessing Ring*event! This event is available in non-Reboot worlds only. You can accept the quest ‘[Lunar New Year] 8-Blessing Ring Fortune’ from NPC Yoria or from the star event notifier on the left side of the screen to receive an 8-Blessing Ring. Then accept the quest '[Lunar New Year] 8-Blessing Ring Enhancement' and defeat monsters within your level range (20 levels below and 20 levels above) to collect the No-Blessing Charms that they drop. If you collect 88 No-Blessing Charms, you can give them to NPC Yoria to receive*an 8-Blessing Charm. You can then use these 8-Blessing Charms to enhance your 8-Blessing Ring to its max bonus stats. *This quest can be completed once per day. 8-Blessing Ring: Untradeable, permanent. Grants STR/INT/DEX/LUK +6, Weapon ATT/Magic ATT +6*(can be enhanced up to STR/INT/DEX/LUK +20, Weapon ATT/Magic ATT +20). During the Lunar New Years events, Fireworks monsters will appear in Henesys, Leafre, and Nameless Town! Occult Cube (x3): Permanent, Untradeable. 2x EXP Coupon (15 min): 7-day duration, Untradeable. Here's where you can spend all your Hong Bao earned during the Lunar New Year event! Speak to NPC Yoria in Henesys, Leafre, or Nameless Town to hear about what's new in the Hong Bao Shop, and access the store by speaking to NPC Hong Bao Shop. 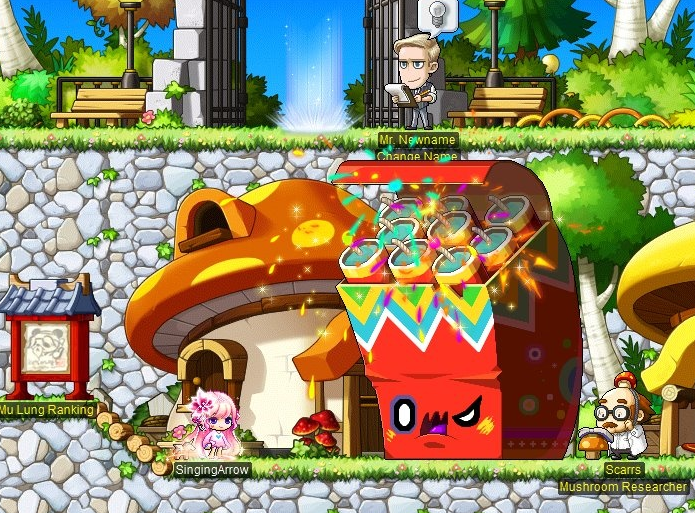 New Year Golden Piggy Chat Ring (30 Day) Coupon: Untradeable, 7-day duration. Limited quantity: 1. Costs 10*Hong Bao. New Year Golden Piggy Label Ring (30 Day) Coupon: Untradeable, 7-day duration. Limited quantity: 1. Costs 10*Hong Bao. New Year Message Atmospheric Effect Coupon: Untradeable, 7-day duration. Limited quantity: 10. Costs 30 Hong Bao. New Year Message Megaphone Coupon: Untradeable, 7-day duration. Limited quantity: 10. Costs 100*Hong Bao. New Year Golden Piggy Damage Skin: Untradeable, 7-day duration. Limited quantity: 1. Costs 200*Hong Bao. Floating Golden Piggy Cape Coupon: Untradeable, 7-day duration. Limited quantity: 1. Costs 250*Hong Bao. New Year Party People Effect Ring Coupon: Untradeable, 7-day duration. Limited quantity: 1. Costs 250*Hong Bao. Lunar New Year For One Chair: Untradeable. Limited quantity: 1. Costs 200*Hong Bao. New Year’s Feast Chair: Untradeable. Limited quantity: 1. Costs 1,000*Hong Bao. New Year Photo Protagonist Wig (F) (30 Day) Coupon: Untradeable, 7-day duration. Limited quantity: 1. Costs 50*Hong Bao. New Year Photo Protagonist Wig (M) (30 Day) Coupon: Untradeable, 7-day duration. Limited quantity: 1. Costs 50*Hong Bao. Movie Protagonist Wig (F) (30 Day) Coupon: Untradeable, 7-day duration. Limited quantity: 1. Costs 300*Hong Bao. Movie Protagonist Wig (M) (30 Day) Coupon: Untradeable, 7-day duration. Limited quantity: 1. Costs 300 Hong Bao. Forever Young Dress (F) (30 Day) Coupon: Untradeable, 7-day duration. Limited quantity: 1. Costs 450*Hong Bao. Forever Young Outfit (M) (30 Day) Coupon: Untradeable, 7-day duration. Limited quantity: 1. Costs 450*Hong Bao. Lunar Festivities Outfit (F) (30 Day) Coupon: Untradeable, 7-day duration. Limited quantity: 1. Costs 250 Hong Bao. Lunar Festivities Outfit (M) (30 Day) Coupon: Untradeable, 7-day duration. Limited quantity: 1. Costs 250 Hong Bao. Lunar Festivities Headpiece (F) (30 Day) Coupon: Untradeable, 7-day duration. Limited quantity: 1. Costs 100 Hong Bao. Lunar Festivities Hat (M) (30 Day) Coupon: Untradeable, 7-day duration. Limited quantity: 1. Costs 100*Hong Bao. Lion Outfit (30 Day) Coupon: Untradeable, 7-day duration. Limited quantity: 1. Costs 200*Hong Bao. 8-Blessing Charm: Available in non-Reboot worlds only. Untradeable, 7-day duration. Limited quantity: 5. Costs 30*Hong Bao. Lunar New Year Basic Boost Potion: Untradeable, 7-day duration. Limited quantity: 3. Costs 50*Hong Bao. Lunar New Year Intermediate Boost Potion: Untradeable, 7-day duration. Limited quantity: 3. Costs 70*Hong Bao. Lunar New Year Advanced Boost Potion: Untradeable, 7-day duration. Limited quantity: 3. Costs 100*Hong Bao. Lunar New Year High Quality Boost Potion: Untradeable, 7-day duration. Limited quantity: 2. Costs 140*Hong Bao. Lunar New Year Special Boost Potion: Untradeable, 7-day duration. Limited quantity: 1. Costs 200*Hong Bao. 8-Blessing Ring Coupon: Available in Reboot world only. Untradeable, 7-day duration. Limited quantity: 1. Costs 1,300*Hong Bao. 2x EXP Coupon (15 min): Untradeable, 7-day duration. Use to receive 2x EXP for 15 minutes. Power Up Buff (15 min): Untradeable, 7-day duration. Use to receive Weapon ATT/Magic ATT +30 for 15 minutes. Each time you complete an additional daily quest, your daily gifts will stack up, so on the second day you'll receive two daily gifts, the third day you'll receive three daily gifts, etc. At the same time, you can also log in each day to receive a*Golden Pig New Year Gift! You can receive these by accepting*the quest '[New Year's] Golden Pig Gift' from the star event notifier on the left side of the screen. Then all you have to do is log in to receive a gift! Gift can be claimed once per world. Golden Oink-Oink Beanie Coupon: Untradeable, 7-day duration. Use to get Golden Oink-Oink Beanie hat. New Years Chair: Untradeable. Restores 50 HP/MP every 10 seconds.